KANSAS CITY, Mo. 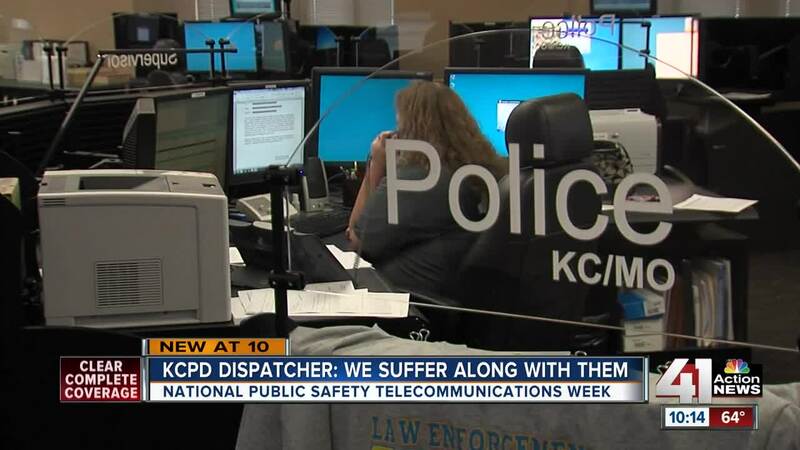 — It's National Public Safety Telecommunicators Week, and the Kansas City Police Department has a special dispatcher kicking the celebration off. Carrie Brown celebrated 28 years as a KCPD dispatcher on Monday. She still remembers her first days on the job. "The first call that I took, I was a call taker and I had a lady on the phone," said Brown, a communications specialist. "Someone was breaking into her house and I could hear gunfire in the background as I was talking to her. I knew I needed to be there for her. I knew I had to stay calm for her." Much has changed over the years to help dispatchers emotionally on the job. "Like if we've handled a critical incident, they'll let us get off of the console for a while. Go take a break, walk around," Brown said. To mark her anniversary, several KCPD officers stopped by to say hi to Brown. "This is my family," Brown said. "I don't know what I would do without them." Every day this week, Kansas City police will showcase a dispatcher in the department to thank them for the work they do all year long.